Description of "DEMYSTIFYING MICROFINANCE (eBook)"
THE BOOK DEMYSTIFIES THE CONCEPT OF MICROFINANCE AND DISCUSSES VARIOUS ELEMENTS, ASPECTS AND CHALLENGES IN INDIAN MICROFINANCE SECTOR IN A SIMPLE AND COMPREHENSIVE MANNER. AUTHOR IS A YOUNG IAS OF MAHARASHTRA CADRE. SHE HAS ALSO GOT WORK EXPERIENCE OF RESERVE BANK OF INDIA AND INDIAN AUDIT AND ACCOUNTS DEPARTMENT. SHE HAS DONE MASTERS IN ENGLISH AND PUBLIC ADMINISTRATION AND IS PURSUING PH.D. IN URBAN MANAGEMENT. 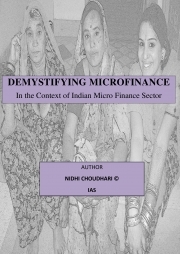 Reviews of "DEMYSTIFYING MICROFINANCE (eBook)"
yet another masterpiece on an interesting subject by an equally interesting author.... kudos to her zeal for writing on varied topics in a simple, lucid manner.